In the early days (1970’s and early 1980’s) there was routine and widespread cross licensing in the industry. Many companies didn’t have the fab capacity to reliably meet demand (IBM wouldn’t purchase a device unless it was made by at least 2 companies for this very reason) so they would contract with other manufacturers to make their design. Having other companies manufacture your design, or compatible parts, also increased the market share of your architecture (8086, 68k etc). For years AMD made and licensed most everything Intel made, AMD also licensed various peripheral chips to Intel (notably the 9511/2 FPU). As the market grew larger, the competition increased, Intel (and others) began to have enough reliable fab capacity to safely single source devices. Meanwhile other companies continued to make compatible products, based on previous licensing. AMD notably made x86 CPU’s that ate into Intel’s market share. In the 1970’s Intel had cross license agreements with AMD, IBM, National, Texas Instruments, Mostek, Siemens, NEC and many others. In 1990 Intel was granted Patent # 4972338: Memory management for microprocessor system. This was to be come known as the Crawford Patent (after its inventor) or simply the ‘338 Patent. It deals with Content Addressable Memory, Page tables, etc. Essentially how to cache and refer to memory via a microprocessor very efficiently. The Pentium and Pentium Pro made extensive use of this patent. It is the ONE patent that Intel routinely cites, by number in most of their P5 and P6 datasheets. While it is likely that other companies copied (legally or not) other Intel designs, the ‘338 patent became the patent by which Intel sought to remedy the problem of their former allies, competing with them. AMD had brought suit against Intel in 1987 for breach of contract. Intel was bound by a 1982 cross license to give AMD microcode for its x86 processors. As the litigation proceeded, well into the 1990’s Intel counter sued AMD for breach of the ‘338 patent. As is common in these cases it was long, drawn out, and result in a settlement. The result of this was, in 1995, a broad cross license. AMD was granted a perpetual license to the 386 and 486 microcode, as well as use of the ‘338 Patent. Intel also had to pay AMD $18 million in damages for breech of contract, while AMD had to pay $58 million for violating the ‘338 Patent. End of story? Hardly. In 1993 UMC, a Taiwanese IC manufacturer (today a contract fab) began making 486’s which knowingly violating the Crawford ‘338 Patent. Frank Lin, a UMC spokesperson said “Nobody can design [an Intel compatible] CPU without using the patent.” UMC figured that since AMD, Cyrix, TI and ST were all violating the ‘338 patent that they could too. Turns out that probably wasnt the best of ideas. 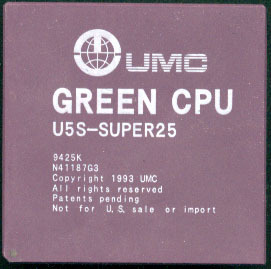 The dispute between Intel and UMC broke out in 1994, when UMC began marketing its version of Intel’s 486 microprocessor. The product was marked “not for sale in the United States.” UMC subsequently filed challenges to the validity of Intel’s patents in Germany, France, the U.K. Taiwan, Hong Kong and Singapore. Intel sued UMC and its distributors in June 1995, in Germany, the U.K. Hong Kong and Singapore. In July 1995, Intel also filed a complaint with the United States International Trade Commission (ITC) against a UMC distributor, Eurone LA, Inc. seeking a permanent exclusion order prohibiting entry into the U.S. of UMC486 microprocessors or products containing them. Intel effectively won, and in 1996 UMC paid Intel damages and agreed to no longer make or sell any more ‘338 infringing products. UMC also agreed to stop litigation challenging the validity of the ‘338 Patent. It should be noted that Intel also claimed UMC violated the 4449184 patent, a patent they previously used to stop Chips and Technology from making the Super386, another competing product in 1992. 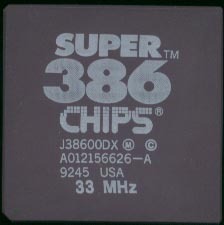 The Super386 was a different pinout than the Intel, but was faster. An interesting note: Chips and Tech. was one of the first fabless companies. Their products were actually fab’d by Texas Instruments (who ironically legally could make them, as was determined later by the Cyrix case, albeit too late for Chips.) The case was settled out of court in 1993, as became a theme, Chips agreed to drop its anti-trust suit against Intel, and Intel agreed to drop the patent infringement suit. In an ironic twist, Intel bought Chips in 1997. 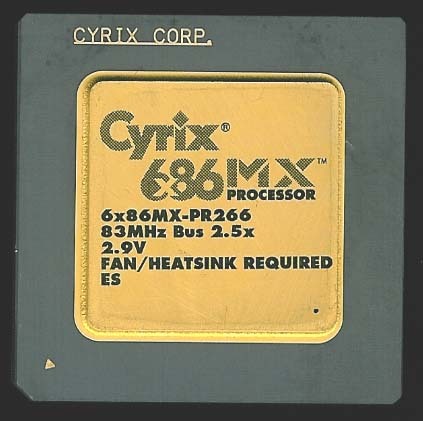 Cyrix also sold processors that violated the ‘338 patent. Intel sued Cyrix for violating thr patent in 1993. It would seem that based on the what happened with AMD and UMC that this case should be clean cut right? Wrong. Cyrix sold processors, but they did not make them themselves. Cyrix was fabless, they had their processors made by SGS-Thomson and Texas Instruments and later IBM. SGS-Thomson (via Mostek which they had bought 1985) had a license to use Intel IP that originated in 1975. Texas Instruments also had such a license dating to 1975, back in the era of friendly cooperation and the wide need for second sourcing. The courts decided that these agreements, applied to customers of TI and ST as well, which meant that as long as Cyrix used a fab that had an Intel license they could do as they pleased. The final settlement was out of court, which was good for Intel, they did not want to risk losing a case on the ‘338, and unlike AMD, Cyrix had built its 486 without using Intel’s microcode, so it was truly an original design, albeit based on reverse engineering and improving on what Intel had done. The story didn’t end with the ‘338 Patent. Cyrix was a newcomer, they worked hard to make a unique processor while maintaining x86 compatibility. They did not resign themselves to an also ran. They were perfectly capable of coming up with their own Intellectual Property, and defending it. in 1997 Cyrix filed suit claiming that Intel had violated two patents which had been granted by the USPTO that day. One related to power management and the other to a chip’s “registers,” a small amount of high-speed memory located within a processor. The infringing product? The P6 architecture, which included the Pentium Pro and PII. Digital also sued Intel for patent infringement of 10 patents not 12 hours before Cyrix sued. “I don’t mind competing against Intel, but I’d rather not compete against our own technology,” Digital CEO Robert Palmer said. “The time has come for these unlawful practices to stop.” Sounds a bit like Apple’s Tim Cook. Cyrix claimed Intel infringes U.S. 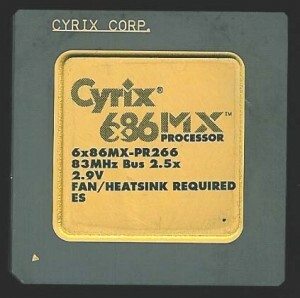 Patents 5,630,143 entitled “Microprocessor With Externally Controllable power Management” and 5,630,149 entitled “Pipelined Processor With Register Renaming Hardware to Accommodate Multiple Size Registers.” The litigation took until 1998, in which time Cyrix merged with National Semiconductor. In exchange for ending the case against Intel, Cyrix was granted a very wide cross-license to Intel’s IP, and Intel was allowed to use the Cyrix patents. This gave Cyrix (and National and later VIA) access to the Pentium II architecture, and again, saved Intel from a potentially embarrassing loss. The previous case was best described as a draw. This case was a clear win for Cyrix, and one of the few times the ‘underdog’ came out ahead against a much much larger company. As you can see, patents and Intellectual Property cases are nothing new. Litigation such as described above, and what is currently transpiring with Apple vs Samsung and across the mobile phone industry is a product of the rapid development of technology, the ease of copying designs, and the often murkiness of what is a valid patent, and what is not. National Semiconductors did not get their license to the Pentium Pro/Pentium II bus via Cyrix. The Pentium Pro/Pentium II bus used Gunning Transistor Logic, which was invented by National Semiconductors. Effectively, Intel was using this bus under license from National Semiconductors. Not to the bus, but in wide part to the rest of the architecture. They were on *most* previous x86 stuff by agreements dating back to the 1970’s. The sad take away from this though is Intel learned that even if they didn’t win these lawsuits, it was a very effective stall tactic. I think Intel “discovered/proved” this against AMD originally with the 386 (sorry “i80386”) to delay AMD releasing 33 and 40 mhz parts. While sure Intel “lost” it did let them stop “official” 386 speeds above 20 to launch the 486-16. Luckily AMD had enough “reserve” to survive this, and lived into the socket 7 era. Is sad that the law departament must be bigger then the technical in today.